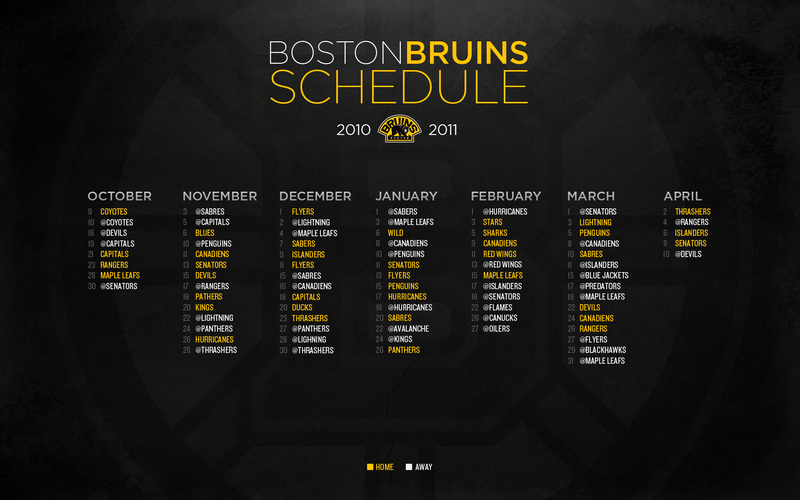 Who are the Bruins playing? 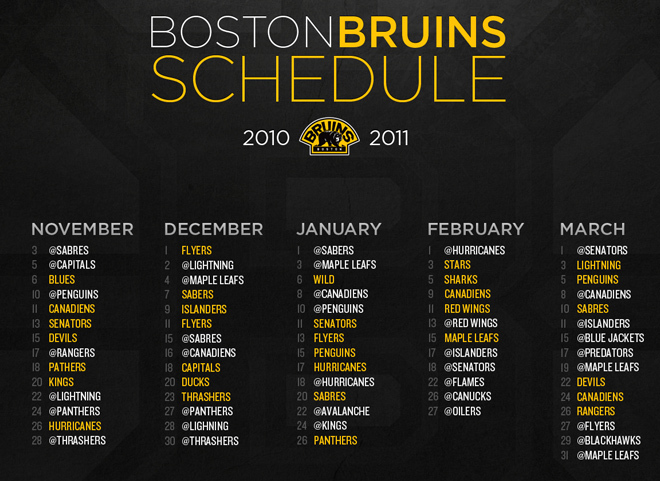 If you’re a sports fan like me you like to have a season schedule around. I’m tired of the fridge magnets and the wallet sized versions so I made something that makes sense for me. I spend most of my time near a computer so it only made sense to make a computer wallpaper. 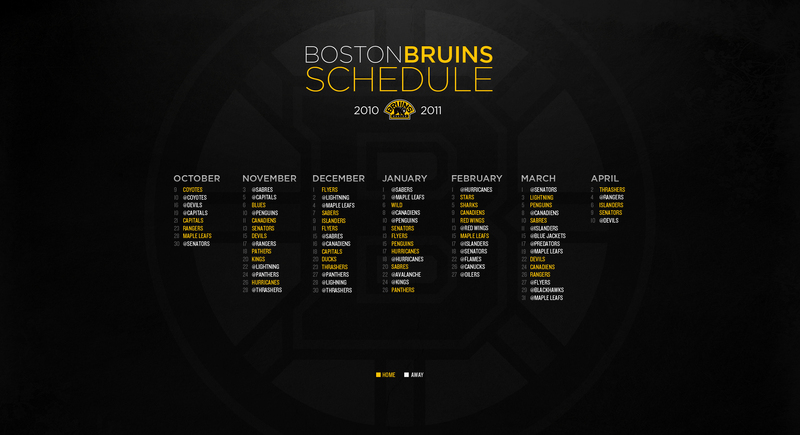 Hockey is my favorite sport so naturally I started with the Boston Bruins. Can I See Your ID Please? During my last trip to the local liquor store I had an interesting conversation with the cashier to helped me and my wife. We placed our beer and wine on the counter and the cashier promptly asked us for our IDs. The cashier told us we didn’t have to take them out of our wallets but as it turns out the design of the new license doesn’t lend itself to being easily read while sitting in a wallet’s clear plastic window. If Cameron Moll’s amazing work wasn’t enough of a reason to keep tabs on his letterpress poster series, maybe the iPad can peak your interest? Cameron has started a series of iPad giveaways aimed at promoting is latest work Colosseo. Here’s what Cameron had to say about taking on The Roman Coliseum as the subject of his latest type poster. I know what you’re thinking, it’s about damn time. You’re right. This redesign was a long time coming. I threw up the old site in a hurry to meet certain needs and it took over a year to actually come up with something I liked enough to finish. It’s not just a redesign though. It’s been completely re-written from top to bottom. The old site was run by Textpattern; now we’re looking at the very powerful Expression Engine running things now. I’m doing this with no warning. I thought about doing it yesterday but I didn’t think I’d actually take the time to do it. While sitting here at An Event Apart, I’m going to attempt to live blog what’s going on. I’ll start with Ethan Marcotte’s Talk about Comps and Code and see where it goes from there. This post currently has 1 comments. This article was sparked by a question put forth by Marc Amos, “If you were given only these options, which would you prefer to use to create website mock-ups: Photoshop or Illustrator? Why?” I was shocked by the resulting answers; more people used Photoshop over Illustrator, 2 to 1. Let me say first and foremost, that I was an art student. I graduated with a Bachelor’s Degree in Fine Arts with a concentration in Graphic Design. I mention this because it is what started me on the path of using Illustrator over Photoshop. As an art student, during the time of Photoshop 5.5, Illustrator was a superior program when it came to creating and laying out text. At that point, Photoshop hadn’t implemented vector-based text yet and print projects, large or small, web design, and illustration, simply looked better in Illustrator.